Enterosgel was developed in Russia during the Cold War, when the Department of Defense confronted scientists with a difficult task: to develop such a universal means of protection against weapons of mass destruction to bind selectively and remove after its ingestion all toxins from the body and protect soldiers from the effects of chemical, biological and radiation damage. Safely and absolutely. A few years later, in secrecy, a group of scientists led by Professor J.B. Slinyakova from Kiev successfully completed the development and managed to get a crystalline substance with amazing absorption properties, which later adopted the name Enterosorbent. Many years later, Enterosorbent was declassified – and became available to ordinary people. In the newspapers of that time, headlines could be found like “The secret development has brought a medicine” or “Secrets of Cold War for the people” – since then vast clinical experience is available, accumulated with deploying Enterosorbent during the treatment of various diseases. 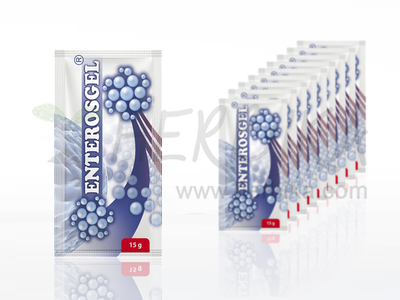 Enterosgel in Russia today is used in many clinics as prelude to the treatment of various diseases as it is very appropriate to start any treatment with detoxification. Then the drug, herb or other therapeutic means has a much greater effect than in a clogged, weary body. Detailed information can be found by clicking on the image.